ItemF-04477 - Port Douglas, the Purcell family. ItemF-04481 - "Lake Windermere auto camp, Invermere, BC." ItemF-04482 - "Hotel Invermere, BC." ItemF-04483 - Mrs. A.G. Cuthbert shingling the first home in Division B, Invermere. ItemF-06340 - "Grown in Prince Rupert, BC." ItemF-06347 - The mills at Swanson Bay. ItemF-02402 - The Nanaimo lacrosse team. 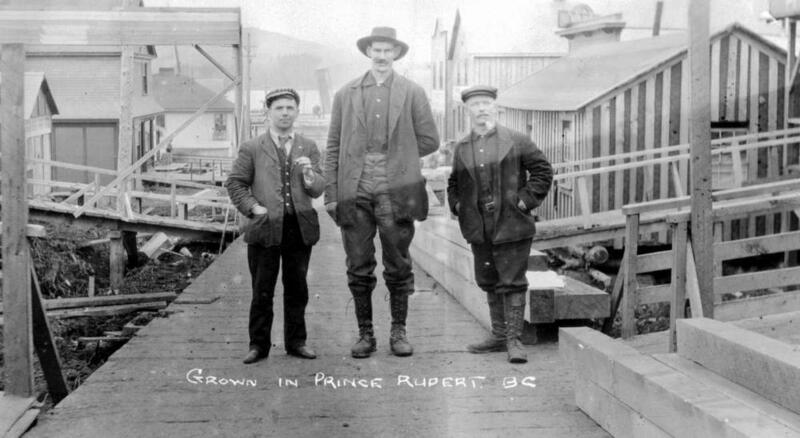 Item F-06340 - "Grown in Prince Rupert, BC."